Need to sleep four people in one bedroom? Our wood quadruple bunks provide a sturdy and safe sleeping environment. Perfect for large families or for vacation homes, lodges, rental properties, cabins, etc. , quad bunks work where many people need to sleep in tight spaces. 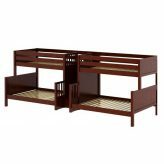 These quadruple bunk beds can be taken apart and used as 4 single beds. 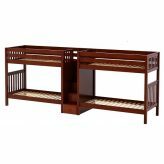 Made of solid hardwood, each single bed will withstand 400 lbs of weight. They meet or exceed ASTM and CPSC safety standards. A staircase between the beds provides a safe way to the top bunks and the steps double as storage. You have a wide choice of finishes as well as colorful play curtains and top tents if you really want to add an element of FUN. What an enticing bed for sleepovers of even camps – anywhere imagination soars. 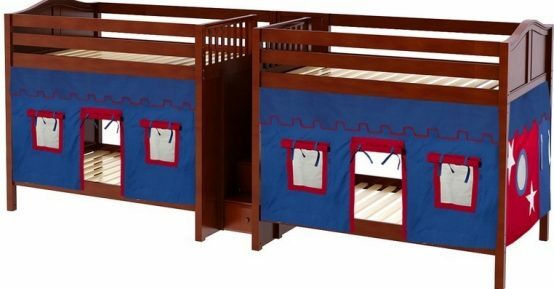 Sleep 4 in one room with wood quadruple bunks!